KOMPAS.com — Followers of the Ahmadiyah Islamic sect in West Nusa Tenggara (NTB) claim to have been prevented by local authorities from going on the haj. The unofficial ban had in place for some time, Ahmadiyah provincial chapter head Jauzi Djafar said. “NTB provincial administration imposed the ban a long time ago, but not openly. Usually, employees of religious offices at district levels would make things difficult for Ahmadiyah members trying to make arrangements for haj permits,” he said. Whether or not the government had imposed a ban was irrelevant to Ahmadis in NTB, Jauzi said. “Even if we were encouraged to go on the haj, our members would definitely have to think very hard about it because where would they get the money for it? We face enough difficulties just putting food on the able, let alone to perform the haj. Perhaps if they were capable financially then they could think about doing the haj,” Jauzi said. NTB Religious Affairs Office head Suhaimi Ismi denied the existence of a ban. 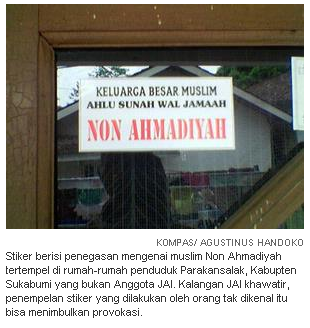 Image Caption in English: Sticker containing the confirmation of Non-Ahmadiyah Muslims stuck in people’s homes - Parakansalak, Kabupten Sukabumi - which is not Ahmadi Indonesia (JAI) members. The JAI worry, pasting stickers by strangers could be a provocation.